For movie fans, one of the best perks of living in Los Angeles is the fantastic array of cultural film festivals all year long: in February, there's L.A. Italia, in May the Japan Film Festival, and from Oct. 9 to 12 this year, the Eighth Annual German Currents, a celebration of the best of new German language cinema. Giving new meaning to the term 'Oktoberfest,' German Currents is a wonderful festival spanning films from Germany, Austria and Switzerland and includes the premiere of two of this year's official Academy Award Best Foreign Film entries, Austria's The Dark Valley and Germany's Beloved Sisters. I chatted with the Director of the Goethe Institut-Los Angeles, Fareed C. Majari, who oversees German Currents to find out more about this unique weekend of film. Xaque Gruber: How has the festival grown in the past eight years? And what aspects are you most proud of in terms of the films being screened? Fareed C. Maraji: Indeed, our festival has grown over the years. We are showing more films now, have a bigger audience, and the festival takes place entirely at the historic Egyptian Theatre in the heart of Hollywood. I can't think of a better place for a festival. My team and I are delighted to screen two Academy Award Foreign Film Entries: Dominik Graf's Beloved Sisters is Germany's entry for the Best Foreign Language Oscar. It is a visually sumptuous period piece that tells the story of the Weimar poet Friedrich Schiller's turbulent ménage-a-trois with his wife and her sister. Although set in the 18th century, the plot is reminiscent of the lifestyle experiments of the '70s. We are excited to present the Austrian nomination as well, Andreas Prochaska's The Dark Valley. Yes, our program includes a genre which one would not expect at a German film festival - a Western movie. Set in the snow-capped Austrian mountains The Dark Valley is an opulent alpine revenge drama that offers stunning imagery and camera work. For the first time we will have a screening for students from schools, who will come by bus to watch a children's movie. This year's line-up includes something for every taste. Some films, like Petra Volpe's Dreamland and Frauke Finsterwalder's Finsterworld are dark and somber, others, like Axel Ranisch's I Feel Like Disco are humorous and uplifting. And the films are all brand new and Los Angeles premieres. XG: I find it interesting that German Currents includes films not only from Germany, but also from its neighboring German speaking countries, Austria and Switzerland - which makes me think there is a collaborative camaraderie between the three countries. Is this true or are the filmmakers in these three countries historically competitive with each other? FCM: Germany's partnership with our colleagues from Austria and Switzerland is proven and free of envy or competition. The film industry of these three countries is intertwined and it has always been hard to tell what's actually a German, an Austrian or a Swiss film. Take Fritz Lang, who was born in Vienna and worked in Berlin, until he had to emigrate to the United States. This is also true today: Michael Haneke, who won the 2012 Oscar for the Austrian submission Amour, was born in Germany. And this year's Austrian entry The Dark Valley, which is part of our line-up, received eight German Film Awards. The same applies to our Swiss partners. Our Swiss Film, Dreamland, was co-produced by a company in Berlin. No envy, for sure. However, we often we need subtitles to understand Swiss German. XG: Germany, Austria, and Switzerland have collectively won Oscar's Best Foreign Language category a total of seven times, and nominated 22 times. This year you have both Austria and Germany's entries in the category - any early predictions? FCM: Hard to say. Beloved Sisters certainly appeals to those members of the Academy who like period pieces like the many films based on novels by Jane Austen, Emily Brontë or Thackeray. The films protagonist, poet Friedrich Schiller (just like my institute's namesake Goethe) are household names in Germany and every school kid knows them. But does Schiller and his love life appeal to a jury here in America? On the other hand, the Austro-Western The Dark Valley fits into an all American genre, but surprisingly not many horse operas have won Oscars. 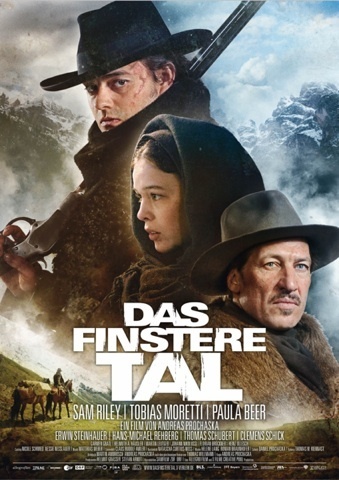 An alpine Western could appeal to a lot of people, though, and the film was extremely successful in the German speaking countries and garnered so many awards there. At any rate, both films are masterfully crafted and deserve recognition. Let's see who will be short-listed. XG: Is there a comedy film in this year's German Currents that you would highly recommend? FCM: If you are into comedies, do not miss out on Axel Ranisch's warm-hearted and incredibly funny LGBT drama, I Feel Like Disco. This coming-of-age story tells of the tensions and struggle to come to terms with each other between a macho father and his son. Hilarious. XG: Can you talk about the multimedia exhibit The Other Worlds of Warner Herzog, which is affiliated with the screenings, but is not at the Egyptian. Where it is located? FCM: We wanted to honor Werner Herzog, who is an icon of German cinéma d'auteur. The director, a resident of our city, has shot more than 70 documentaries and feature films all over the world. The exhibition The Other World of Werner Herzog is shown at the WUHO Gallery on Hollywood Blvd., just a stone-throw away from the Egyptian Theatre. The Other Worlds of Werner Herzog, was curated by Krzysztof Stanslawski, and it was first exhibited in honor of Werner Herzog's 70th Birthday in 2012 at the Centre of Contemporary Art in Torun in Poland, and we are honored that Werner Herzog will most likely be there in person. XG: Let's say I am enjoying these German language films so much that I want to go eat some great German/Austrian food in L.A. afterward, where do you recommend? FCM: No need to go far. We will serve Bratwurst and German beer after the opening film. XG: For someone who has never been to German Currents before, and knows little about the films made in these countries, what do you hope they come away with from the experience? FCM: They will have seen a wide range of entertaining, inspiring, challenging and intriguing films from three countries that have a lot to offer where it comes to cinema. And when the curtains fall and the lights are dimmed - it's not over. Throughout the year you can watch or borrow German movies at the Goethe-Institute on Miracle Mile. For more information on German Currents, check out here.